Windows 10 April 2019 Update is the very first major update for Microsoft’s constantly-evolving Windows 10 operating system this year. Also referred as Windows 10 version 1903, or codenamed 19H1 during development, this Windows update proves that Microsoft is here for constantly updating and providing us with the very latest features, tools and apps. The Windows 10 April 2019 Update follows the Windows 10 October 2018 Update and the Windows 10 April 2018 Update. Both these update were indubitably highly successful, as provided Windows 10 users with many helpful features. However despite this, also had their some controversies and issues as well. But hopefully such will not be the case with Windows 10 April 2019 Update. This Windows version will avoid all these sort of issues. With this Windows Update, majority of the Windows 10 users are highly curious about its exact releasing date. Now for this update, currently we can’t provide you with any exact date, as Microsoft has not announced it officially. But as far as the name is concerned – in April, chances are high that it will launch in April. As the launching time of Windows 10 April 2019 Update is coming near, Microsoft has started releasing early versions to Windows insiders. This is especially for all those customers who have signed up to try out the latest Windows 10 version. About these released versions, it would for surely not be wrong to say that they have provided us with an approx idea of the new Windows 10 19H1 features. So, read on this blog to find out the Windows 10 April 2019 Update release date, news and features. 3.7 Windows 10 April 2019 Update Will Now Allow You to Pause Updates, Too! As discussed above, till yet no official release date has been announced from the Microsoft’s side for the Windows 10 April 2019 Update (Windows 10 19h1/1903). However going by the name, we can have a good guess for sure. As the name implies, its very likely that this Windows updated version will be finally ready to download at some point during April 2019. Nonetheless, we can’t say that’s a complete certainty. Its mainly because of the latest year’s Windows 10 update. Yes! Last year Windows 10 April 2018 update not just released in April, but came with a final emergence after some days on April 30. So, yeah, this might be the case this time also. With any major update related to an operating system, delay and problem can occur. So, the Windows 10 2019 update is also not guaranteed. 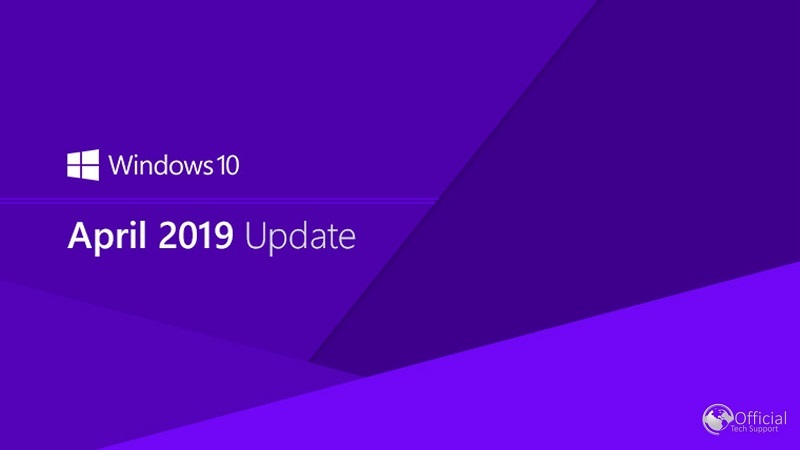 However if its about Windows 10 1903 release date, then because of the fact that it has been named update April 2019, we could assume that it will release during April. As we just hope this time Microsoft would not like to face the embarrassment of releasing an update with an outdated name again. As discussed above, Windows 10 April 2019 Update is also referred as Windows 10 version 1903 and by its codename Windows 19H1. From this codename 19H1, we got our clue to the Windows 10 19h1 release date and possible name, as it simply suggests the update will be released in the first half of 2019. About this Windows 10 2019 Update name, rumors had been swirling since long that it would be April 2019 Update, following on from its April 2018 Update last year. One another rumor confirms the name of this update as the Windows 10 April 2019 Update, as a reference to the April 2019 Update got spotted in the Windows Powershell tool at time when the ‘Get-VMHostSupportedVersion’ command got executed. Additionally, a reference founded by a Twitter user namely Tero Alhonen, has been referred as the till yet strongest evidence proofing that it will be called the Windows 10 April 2019 Update. So, yeah, considering all the evidences, including the Microsoft’s past naming convections and the fact that it genuinely wants to get release in the first half of 2019, we’re pretty confident it will be named the Windows 10 April 2019 Update. As discussed above, all the released early versions of Windows 10 19h1 update which is available for the Windows insiders (like ourselves) to try for free, gives up a good idea of some of the latest Windows 10 1903 features. Hopefully these features will be heading to Windows 10 with this update. Though this list of Windows 10 19h1 features which we’ve listed here below does not includes every Windows April 2019 latest features. But we’ll for surely update it with the announcement of the Windows 10 2019 Update major features. Note: It might be possible that some of the features mentioned here below will not be there in the final version of the Windows 10 April 2019 Update for several reasons. About Windows 10 April 2019 Update, assumptions are high that it will bring a new Light desktop theme, making a nice contract to the Dark theme. Of this we’re used to with Windows 10. This will not only make the taskbar and Start Menu lighter, but several new icons have been created that better suits this new light theme. The best of all, with this Windows April 2019 update, you will be able to mix and match parts of the Light and Dark theme to get a look which perfectly suits your tastes. Since beginning Microsoft has continued tweaking the Start menu. And so in the case of Windows 10 April 2019 Update. Start menu of this Windows 10 Updated version is much less cluttered, with tiles and shortcuts for pre-installed apps not taking up as much as space as of older versions. However yet there are still a number of apps and games which comes preinstalled and chances are high that you’ll not want to use them. But the good news is that with the Windows 10 19h1 update, you can now uninstall more pre-installed apps that you used to. One another noticeable change that comes with the Start menu of this Windows version is in the form of switching the Start menu to have its own dedicated process – StartMenuExperienceHost.exe, instead of being hosted by ShellExperienceHost.exe. Now despite the fact that it sounds like a complex change under the bonnet, in reality its just a noticeable ramification for the user that the now the Start menu runs more smoothly, and is more protected from potent issues that might be rendered by several other areas of the OS. So, according to Microsoft, the Start menu of this Windows 10 1903 version is indubitably more trustworthy one and responsive one too. This is mainly because now Start doesn’t suspend itself any longer, so makes for a little quicker launch time. Currently Windows 10 has a search bar which is integrated with Cortana. But now in the Windows 10 latest update Windows 10 19h1 version, they’re separating. This time the search bar and cortana has been designed in a manner that the search bar will function as a normal search box and there’s will be separate Cortana icon on the Windows taskbar. You can leave the search box on the taskbar and hide the Cortana icon or can hide the search box and leave Cortana. And of course, can hide the both. So, now clicking search icon will provide you with a straightforward operating system search. And if wishes to summon Cortana, you’ll have to use her separate icon. If wishes to uninstall more in-built apps completely, then now with Windows 10 1903 update version, you can do it. Windows 10 allows you to uninstall some of the built-in apps such as My Office, Solitaire and Skype, but now you will be also able to uninstall in-built apps like Groove Music, 3D Viewer, Mail, Paint 3D and more. Windows 10 1903 version includes a notification (system tray) icon for updates. To enable it, you’re just required to head to Settings > Update & Security > Windows Update > Advanced Options and enable the ‘Show a notification when your PC requires a restart to finish updating’ option. After doing this, you’ll see a Windows update icon with an orange dot in your taskbar notification area. This orange dot will get visible at time when your PC will need reboot for updates. It’s for surely a better way to get alerted about required reboot than a full-screen message. History clearly shows that Microsoft includes tendency of changing its update naming scheme constantly. Windows 10’s October 2018 Update was named Redstone 5 during development, and the previous four were also ‘Redstone’ releases with different numbers. Now in the current scene, to keep the things even simpler, Microsoft has named the April 2019 update 19h1 and has scheduled it to release in the first half of 2019. Despite the fact that this sounds quite simple, now the scenario is a bit different. Now the Microsoft has abandoned its new naming scheme and assumptions are high that its about to change the naming next time around. The releases after 19H1 will reportedly be codenamed ‘Vanadium’ and ‘Vibranium’, since now the Windows 10 is aligning its naming with the Azure team. Windows 10 April 2019 Update Will Now Allow You to Pause Updates, Too! The Windows 10 April 2019 Update (or Windows 10 19h1) will allow people using Windows 10 Home edition to pause Windows updates for a set number of days. Its quite handy feature providing you with time to check out and ensure that the update is working properly. And in case of issues, you will be able to pause the update until their fixation. This Windows 10 1903 feature is mainly for the Enterprise and professional Windows 10 users. So, yeah… its good to see it come to the Home version also. Failure of Windows update while installation is a common issue that occurs at time when PC’s not having enough of free space. This is actually the issue with inexpensive devices that only comprises a small amount of built-in storage. Microsoft is now solving this issue with its Windows April 2019 update by commandeering about 7 GB of your PC’s storage and making it into reserved storage. This space will be used for the Windows update, however the programs can store temporary files here. But whensoever Windows will need space for updates, it will delete the temporary files and perform the update. So, in this way, space will not get wasted completely, as files on computer will be able to sit there in the reserved storage space. So, this was all about the Windows 10 April 2019 Update we know yet far. Hopefully with this blog, we succeed in providing you with a closer look at upcoming Windows 10 April 2019 Update (19H1). However if think we’ve missed something here about Windows 10 19h1 update which you know, kindly feel free to share it with us in the below comment box.